When and why did you decide to come to Uganda? I came to Uganda in 1987 after my high school to visit my elder brother, Mohammed El Hamid, the owner of Pan Afric Impex. I was supposed to proceed to the US for my university education on the advice of my father. But I fell in love with the country and decided to stay. Why did you decide to stay in Uganda? I just loved the country. The people were warm. I saw lots of opportunities and had the backing of my elder brother. What was the first business you attempted in Uganda? And how did you move into milling and other businesses? How did you accumulate enough capital to go into manufacturing? How did you move from that one mill to the diversified manufacturing empire you are running today? But you are also into transportation. What did fleets of trucks have to do with what you were doing? Today, we have a fleet of over 200 trucks ranging from small three-tonne trucks to 60-tonne trucks serving mainly our internal transport needs. However, occasionally, we hire them out for commercial use. Any other business you own locally and abroad? I also own a company called AYA Investments, which invests in big local projects like the Hilton Kampala Hotel. I am currently into construction and mining locally. In Dubai, I own a trading company that deals in general merchandise across Middle East and Africa called Aya Mohammed Trade plus a real estate firm in Manhattan, New York, USA, that deals in both residential and commercial properties. You have talked about being in the mining business. This is new. Tell us more about this venture I acquired an exploration and mining licence in Karamoja for gold through my AYA Mining company. However, I haven’t yet struck major gold in spite of the fact that exploration has been going on for some time. Putting all your ventures together, what do you think is your total net worth? Considering all my businesses, I will put it at about $400m. AYA Investments (U) Ltd Manages a diversified portfolio of industrial and commercial real estate. One of the division’s principal projects is the development of Hilton Hotel. AYA Mills operates one of the largest commercial milling facilities in East Africa and is home to some of the region’s finest flours. The facilities utilise modern equipment, including state-of-the-art Ocrim mills, which are capable of producing up to 8,500 tonnes of flour per month. Last year, the AYA Group established the first gold mining facility in Uganda. The project is expected to expand its operations into the processing of metal from other east African nations. Aya Biscuits operates the newest and most modern biscuit-making facility in Uganda, utilising the latest Polin Machinery imported from Italy. The leading millers of wheat flour in Uganda, the company’s mills are located in Kawempe, Kampala. Pan Afric Commodities was one of the 10 finalists in the 2005 Investor of the Year Awards. A leading hauler in the east and central African region, the company has state-of-the-art trucks capable of handling containerised and bagged freight. Major routes of FIFI Transport include the port of Mombasa in Kenya and Kampala. They also operate in Southern Sudan. The largest commercial bakery in Uganda, the company supplies fresh bakery products daily to Kampala and central Uganda. Last decade, you ventured into hotels and are setting up Hilton Hotel, one of the most visible landmarks in Kampala. Tell us about this project. The hotel will be operated by Hilton International. We intend for it to be Kampala’s number one address for tourism, leisure and entertainment and one of the best hotels in Africa. It is designed to the highest international standards with a dramatic palm-lined road that leads to a domed five-storey atrium and a sculpted 22-storey tower. We set up in grounds with a waterfall. We are hoping that this will become an internationally-known landmark for Kampala. We have built about 272 luxury suites and guest-rooms offering an unparalleled range of facilities with three restaurants and two bars for entertainment, a large health and beauty spa, conference and meeting facilities for over 1,000 delegates and ballrooms for private functions. Upon completion, how much do you estimate it will have cost? The entire project will cost $150m (sh350b) by the time it’s done. We hope that will happen this year. Why did you decide to venture into such a challenging and expensive project? I started the project in 2006 and it was inspired by a number of factors. First, I have travelled around the globe and have hosted a number of my friends and business partners here, who always wondered why such a beautiful country doesn’t have a landmark like a five-star hotel. This is one of the reasons I decided to undertake this project. Secondly, I make a lot of money from this country. I feel obliged to add something of a landmark; something that will have my name on 50-70 years from now for all the good I have got from Uganda. I also believe undertaking such a project that will employ over 2,000 Ugandans directly and bring in a lot of foreign exchange is a way of giving back to Uganda and its people for the business, support and the warmth they have accorded me. I also love taking on big challenges. That is exactly what this project was for me when I first conceptualised it. This project has had a number of ups and downs, including some nasty legal battles and has also delayed completion, what do you think was the cause of all this? Yes, there is a lot of envy from people, who are fighting the project for their own gain. They are trying to sabotage us; exaggerating things and painting the entire project negatively. Then there are people second-guessing us, while others are claiming we hijacked the land on which the hotel stands. These people want to see the project fail. This project is also a very detailed and complex piece of architecture, so it takes time to bring out the finer details. That is the other reason it’s taking time. Aside from the challenges you have faced with the hotel, what other challenges have you faced doing business in Uganda? Bureaucracy, especially in government departments, which slows vital business processes. Acquisition of licences is a major challenge to businesses, for example. Corruption among politicians, who are looking for kickbacks from businessmen is a pain. Sometimes they go as far as trying to fail you by fighting you because you refused to bribe them. The thunderous appreciations to Mr.Hamid. I am also a Ugandan teenager looking for what to do upon my future. So Mr.Hamid and your company am kindly requesting you a job. Hope my request will be put under your consideration. Allow me to say good day!! You have made your hotel nice and beautiful, congratulation sir Hamid. I am a Filipino citizen who is working here in one of the biggest hotel/resort located at Mombasa, Kenya as the Executive Housekeeper. I have been in the hotel industry for almost 12 years now. And mostly I am part of pre-opening team who are opening a new hotel or renovated hotel. I am applying for the position of Executive Housekeeper, you may contact me at my mobile # 0716287303. Hoping to hear from you soon Mr. Hamid. I would like to thank Mohammed Hamid for the good heart and his love for Uganda. I happen to be one of his hundreds of employees at AYA wheat mills Kawempe, and unlike other so called investors who exploit and mistreat the local employees, Mr Hamid is a transparent, fair, approachable and time abiding person. However he has the issue of his bodyguards always surrounding him making it difficult for some people to reach him. Many have come up with such buildings in Uganda calling them Hotels but got a chance to know what happens inside, terrible....Preserve standards. Gideon, The Hospitality Solutions Team,a Hospitality training and consultancy firm with offices at Amber House, Kamapala. This is really wonderful. Starting from streets to where you are now is quite motivating,impressive. You are such a down to Earth man who deserves all the respect. Giving back to Uganda what you have earned from them should actually give you all the respect. Constructing such a hotel which to me should be a 7* if at all one exists....more like the famous Burj Al Arab in UAE. Congrats to you Mohammed and may Alah bless the work of your hands as you battle to complete the construction full of challenges. Wish you the best and you stand a Hero. lthink you should be ready to compete with the rest of the hotels, like serena which is offering the best service, its almost next to none, i know you have enough capital. Thanxs for the opportunities which you have given to ugandans hence i had completed my course in IT in BUSINESS with seeking for vacancy with exprience. Thanx for investing in our country.i completed my diploma in IT in Business.is there avacancy thanx alot. 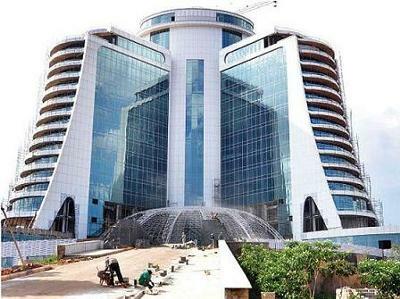 Is the KAmpala Hilton Open for business? I was in Kampala last week of April 2013 to first week of May, and I saw a big construction crane over the Hilton Hotel. I asked my driver whether this landmark hotel was open, I just wanted to stop by and check it out see if they have nice restaurants or cafe etc. The driver admitted he did not know, but was quick to show me the big crane and added "Sir, I believe it is still under construction". So, I never stopped by, mainly because I was very busy the whole time, and also because I was not sure the place was open for business. Can you reassure people like me that you are actually open! Am looking forward to hear from you or to give me the right procedure on how l should apply. Mr. Hamid, you have won my respect, because you are a simple, sincere, and yet excellent businessman. I am a Ugandan in Diaspora, I last visited Kampala in 2010. I saw the Hilton under construction from Kololo hill, now I am glad it's complete. Yes, it is a landmark for Uganda. I hope you are also a citizen of Uganda, if not please consider it. Thank you for advertizing our country. I hope to come by soem day with my friends and enjoy the Kampala Hilton. god bless you!